Au lendemain de sa superbe victoire sur Hakuho, Abi (3-4) a fait une nouvelle victime d’envergure en battant l’ôzeki Goeido (3-4). 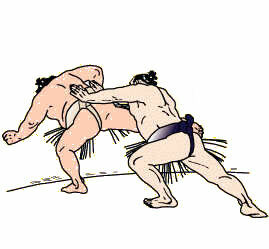 En anticipant la charge de son adversaire, Abi a rapidement ajusté sa position pour désorienter l’élan de Goeido avant de l’envoyer s’écraser au sol. Les deux yokozuna ont obtenu une victoire de routine et maintiennent leur score avec juste une seule défaite. 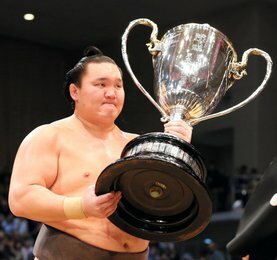 Le grand champion Hakuho (6-1) a rebondi après sa défaite surprise de la veille contre le maegashira Abi, en conduisant rapidement Chiyotairyu (4-3) vers la sortie. Le yokozuna Kakuryu (6-1) a dû travailler un peu plus pour sa victoire face à Yutakayama (0-7). 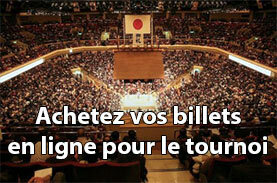 Le sekiwake géorgien Tochinoshin reste le seul lutteur avec un record parfait, et a obtenu sans combattre sa septième victoire après le forfait de Endo. Le komusubi s’est retiré plus tôt dans la journée en raison d’une blessure au bras droit. Endo, qui a été promu au plus bas des trois rangs « sanyaku » a été blessé la veille dans sa défaite contre le komusubi Mitakeumi. Shohozan a remporté une victoire impressionnante contre le sekiwake Ichinojo (4-3) malgré un désavantage de poids de 84 kg. 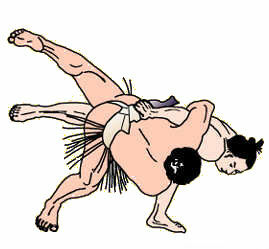 Shohozan a eu une emprise sur la ceinture de son adversaire avant de le renverser à l’aide d’une projection. 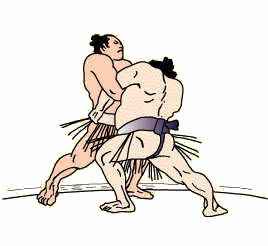 Mitakeumi (4-3) a fourni peu de résistance au maegashira 1 Kaisei (2-5), en essayant en vain de repousser les 204 kg du brésilien. 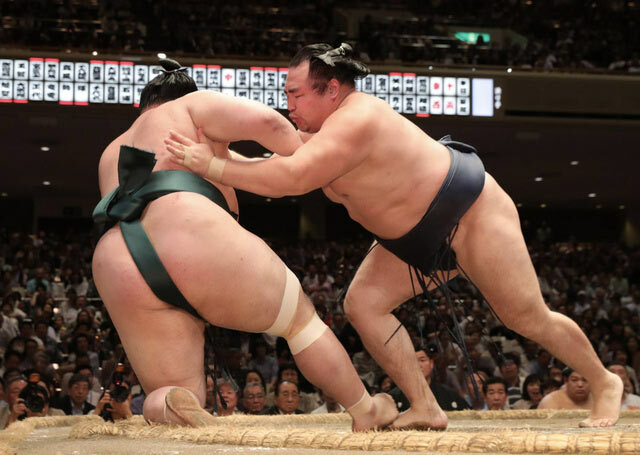 Both yokozuna remained a win off the pace Saturday with routine victories on Day 7 of the 15-day Summer Grand Sumo Tournament. 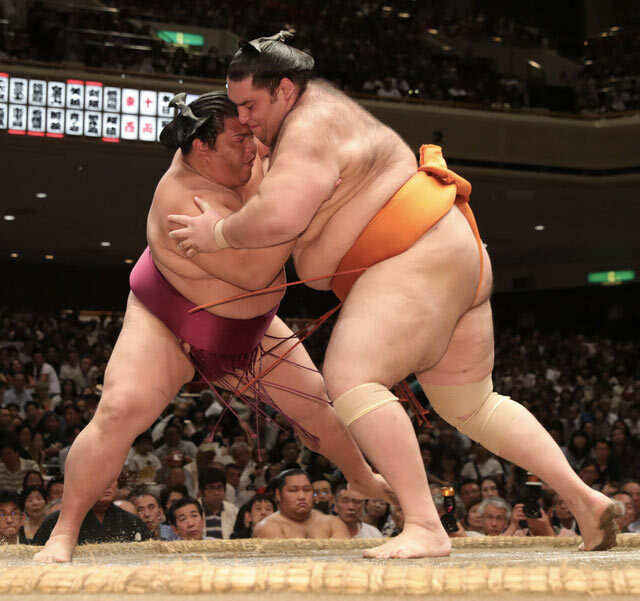 Grand champion Hakuho (6-1) bounced back from his shock loss to second-ranked maegashira Abi the previous day at Ryogoku Kokugikan, quickly forcing out No. 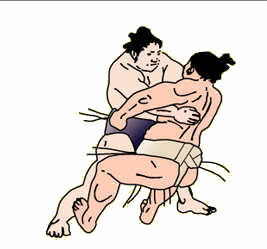 4 maegashira Chiyotairyu (4-3) by the belt. 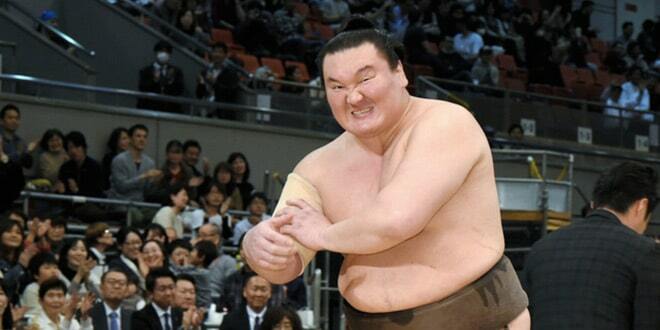 Fellow Mongolian yokozuna Kakuryu (6-1) had to work a little harder for his win, wheeling away from No. 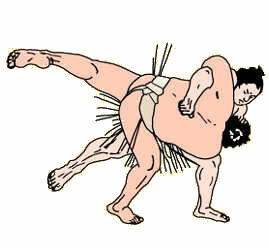 3 Yutakayama (0-7) before thrusting him down. 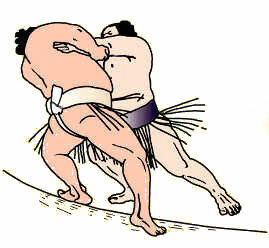 Georgian-born sekiwake Tochinoshin remained the only wrestler with a perfect record, moving to 7-0 with a default win over komusubi Endo (3-4), who withdrew from the tournament earlier in the day with an injured right arm. 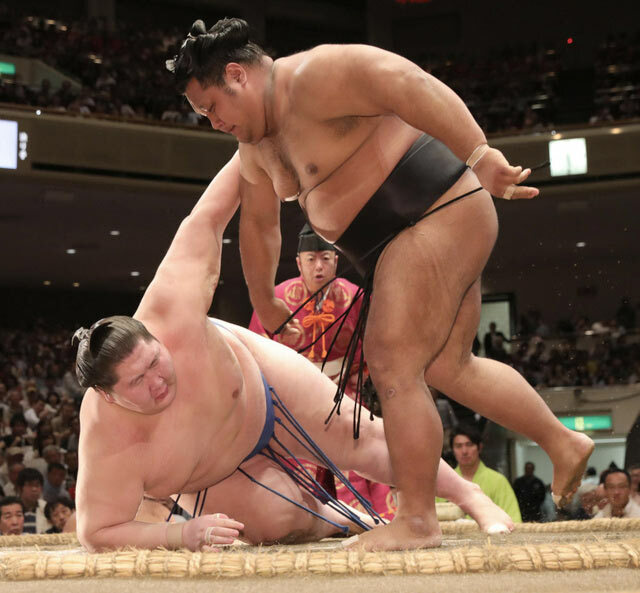 Endo, who was promoted to the lowest of the three « sanyaku » ranks beneath yokozuna following the Spring Grand Tournament, suffered the injury in his loss to fellow komusubi Mitakeumi on Day 6. 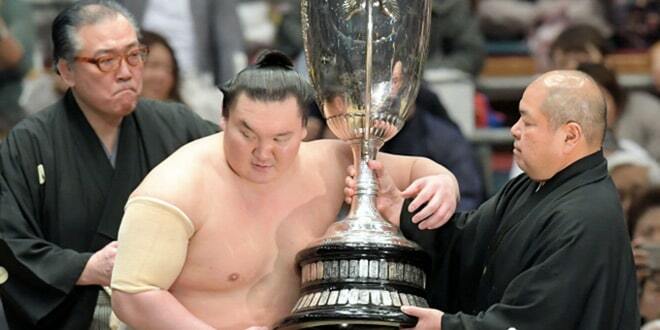 A day after his stunning win over Hakuho, Abi (3-4) claimed another high-profile victim, making short work of ozeki Goeido (3-4). 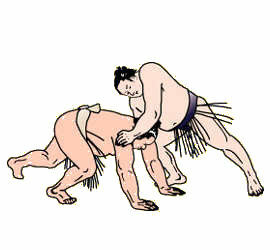 Anticipating his opponent’s charge, Abi quickly adjusted his position before redirecting Goeido’s momentum to send him to the clay. No. 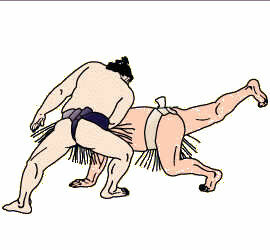 2 Shohozan pulled off an impressive win against giant sekiwake Ichinojo (4-3) despite an 84-kilogram weight disadvantage. 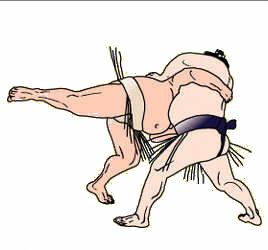 As the pair locked up in the center of the ring, Shohozan got a grip on his much taller opponent’s belt before upending him with a turning throw. 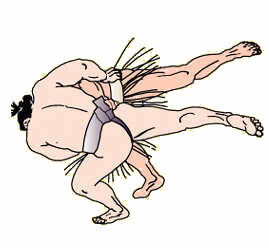 Mitakeumi (4-3) provided little resistance to No. 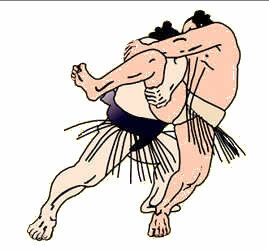 1 maegashira Kaisei (2-5), trying in vain to push back the 204-km Brazilian before being hoisted over the straw by his belt.